Here we are well into the second half of October, have you started your holiday projects yet? 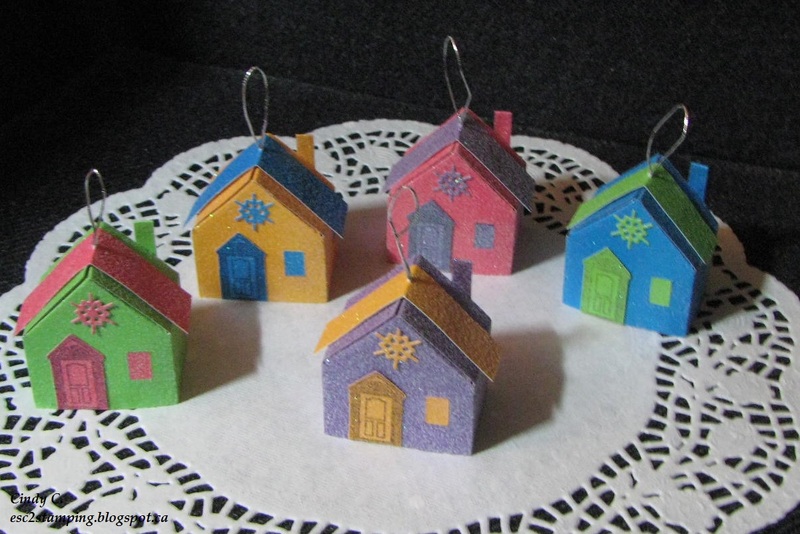 To be honest I have not make too many holiday cards yet, but I did play with Hero Arts 3-D House die. 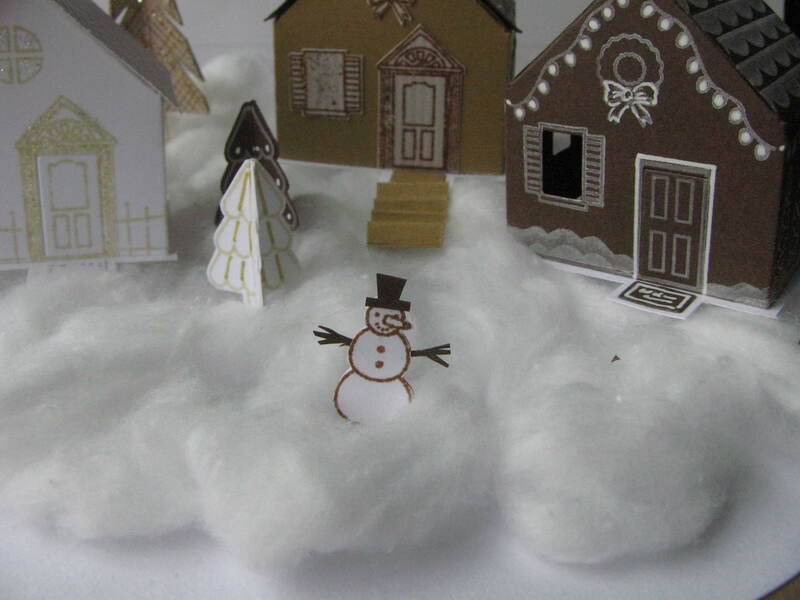 It is a decoration I am calling Mini 3D Village. 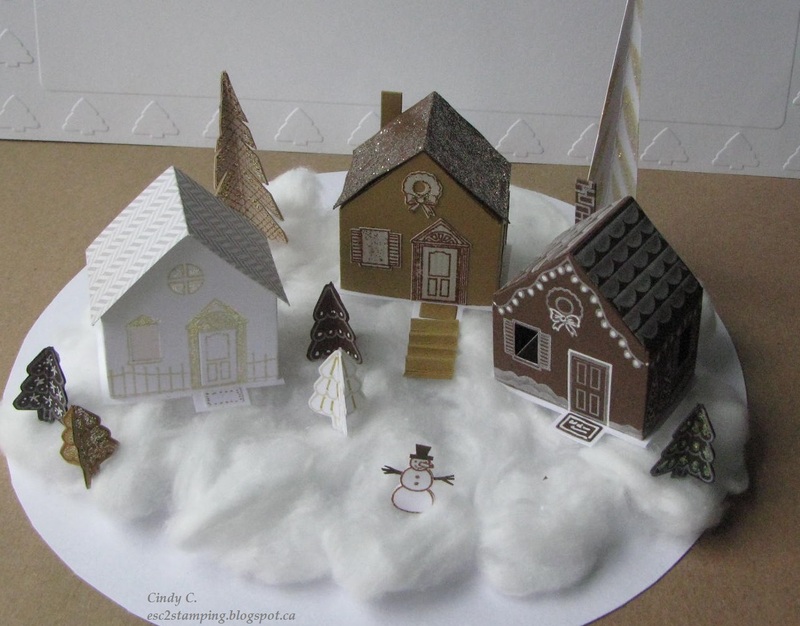 I am not good baking real ginger bread to make houses, so instead I made a paper version. I use the Hero Arts 3-D House Essentials stamps for the stamping. 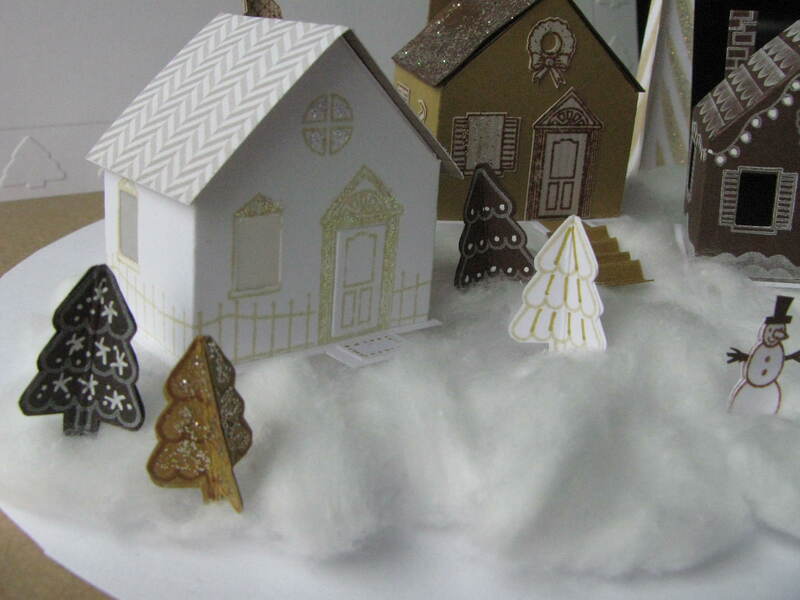 Die cut 3D house using white CS, caramel CS, and chocolate CS. Stamp door, windows and fence with Antique Linen ink, add Diamond Stickle on white piece. Adhere vellum in the inside to cover window. Assemble house. Stamp door, windows and wreath on cream CS with Vintage Photo ink, cut out and adhere onto to caramel piece. Assemble house, add extra piece chocolate CS on roof and add Platinum Stickle on roof. Stamp door, windows, wreath and strings of light on chocolate house die cut with Unicorn ink, use white gel pen to highlite areas as shown. 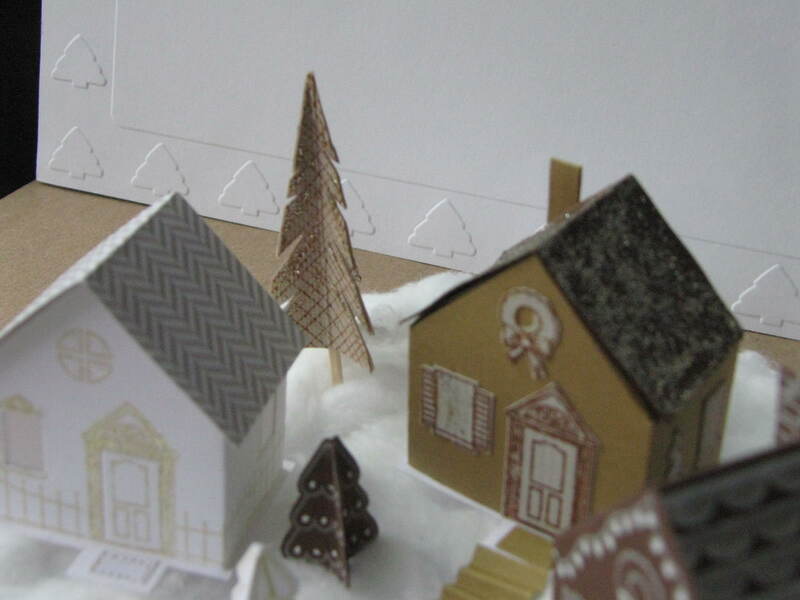 (Note that the pattern on the chocolate house roof is from another stamp set). Stamp Christmas tree from the 3D House Essential set multiple times on various CS, cut out, add extra doodle, score and glue together as shown. Stamp Snowman three time on white CS, cut and glue together, add tiny tree branch shape and top hat. I added a bottom layer to the houses including door mat. I thought that makes it a little more realistic. For a 360 degree view, please hop over to my blog Here. I made a second project with 3D House die and glitter paper. Do you make any holiday decor? Or may be home made gifts? Need some supplies? Visit the a2z store. Feel free to use promote code Cindy15 at check out to obtain 15% off any purchase of $25 or more (shipping not included). And if you do make a “Fall” card, get all the details and link up to our October Challenge Here. Please note that we are also on Twitter, Instagram and Facebook. Follow us on these social media outlet if you have not already done so. You don’t want to miss out on any future promotion! Categories: Christmas, Home Decor | Tags: fall, holidays, Season | Permalink. 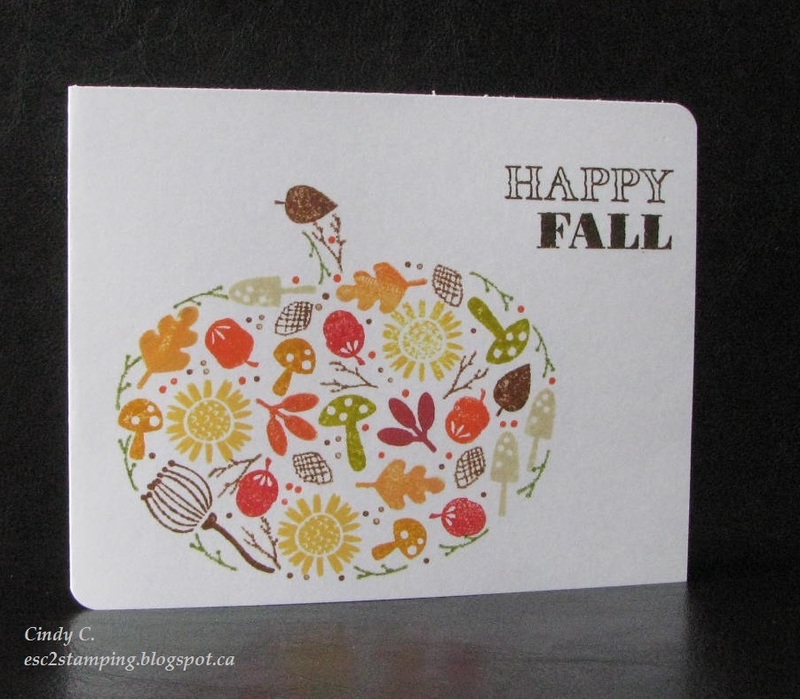 Cindy here to share another card for All Things Fall. Well I struggled a little bit to come up another Fall card, so I thought why not play with some favorite stamps and who know what would sparks. Well guess what?! I saw some cute little mushrooms, leaves that resemble Red Oak and White Poplar, acorns, and Sun flower (from one of my favorite sets)!! These are all perfect Fall icons. Ding!! A light bulb lit up in my head! I present to you this fun, one layer CAS card. I really had fun using these small stamps!! On scrap paper draw outline of pumpkin, cut out the pumpkin. This will be the guide for the stamping. Stamp the images from Hero Arts Garden Flowers by Lia with various inks to fill the pumpkin shape. Remove the “guide”, stamp sentiment from Hero Arts Autumn. Easy peasy right? You could switch up the sentiment to say Happy Halloween, Happy Thanksgiving, Happy Harvest..etc. Have you start you holiday projects yet? Need some supplies? Visit the a2z store. Feel free to use promote code Cindy15 at check out to obtain 15% off any purchase of $25 or more (shipping not included). And if you do make a “Fall” card, get all the details and link up to our October Challenge Here. Categories: Handmade Cards | Tags: fall, Flowers, pumpkin, Season | Permalink.